Prayer plays a strategic role in the life of every believer; intercession is only one dimension of that prayer. It is a critical tool in the spiritual arsenal available for us. Yet, it is perhaps the least understood! Perhaps one of the best books written on the subject is “Intercessory Prayer” by Dutch Sheets. It is worth both a read and a study. I’ll just scratch the surface and leave the deep theological stuff to the pros. The word Paul uses here for intercession is (1783 Strongs) énteuksis. It means intervention or more literally “to strike, hit the mark or the bulls-eye“. i.e. following His will to act as His hand extended (cf. 1 Jn 4:17). Intercession is the faith prayer joining God’s will in heaven and His perfect desire on earth. The mystery is He chooses to use His people as the conduit through which His power flows. Therefore, the first posture of the intercessor is on our knees waiting to hear and to know what God’s perfect will is in a situation. In the midst of a fast paced culture where identity often rests on results, this can be a difficult position to assume. First, it requires the laying down of our own desires and longings. Then it demands perfect trust in knowing we can hear the voice of the Shepherd clearly. God’s voice will always line up perfectly with His Word. His word reflects His heart and character. Just as in any relationship, the only way to truly know His heart is by spending copious amounts of time with Him. Jesus led by example when confronted by the chief of adversaries. To every attack He used the word of God as His only weapon! It is obvious that the devil also knows the word of God and from the beginning has used it in a variety of twisted and distorted forms. The sword is part of the armour to be employed daily. It is interesting to note the word of God is our only offensive weapon. 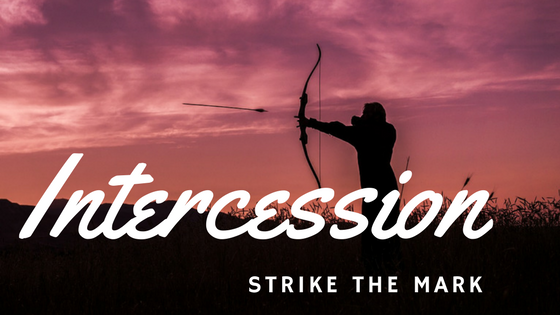 Intercession, more than any other type of prayer, is a precise instrument for offensive attack on the enemy’s onslaughts. To know the word, here meaning the written word (logos), of God is imperative to our ability to wield the sword hitting the mark. stand firm and see the deliverance the LORD will give you. That sounds familiar! But what is surprising is that he appoints singers to lead! How many volunteers would we get for that choir today? The strong guys with weapons were in the rear! Now that is faith in motion! As an intercessor, one simultaneously and interchangeably assumes all three roles: waiting on the Lord, warring on His behalf, and worshipping and adoring Him alone. Positioned under the finished work of the cross of Christ, the intercessor stands in the chasm between heaven and earth releasing the will of the Father towards the children of man. eyes once spiritual blind to see the Light of Life. Soldiers take your positions! Strike the mark!